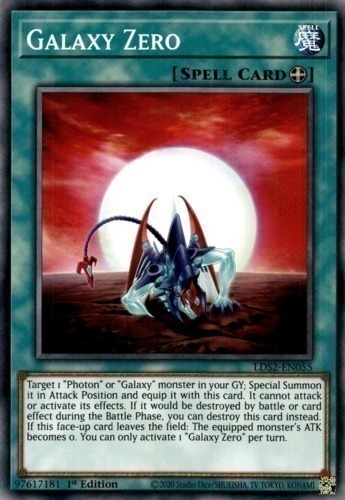 Target 1 "Photon" or "Galaxy" monster in your Graveyard; Special Summon it in face-up Attack Position and equip it with this card. It cannot attack or activate its effects. If it would be destroyed during the Battle Phase, you can destroy this card instead. When this card leaves the field: The equipped monster's ATK becomes 0. You can only activate 1 "Galaxy Zero" per turn.